Discount - Limited Time Only! 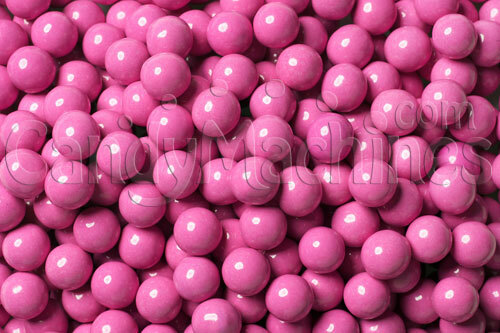 Sixlets are the candy coated chocolate flavored candies back from when we were kids, and now they are available in a hot, hot, hot bright pink decorator color. Each candy ball has a finely polished shiny finish making it an attractive decorating candy. Great color for any girl, this Hot Pink chocolate candy is a bright decorating color to use all by itself. Or, mix it with our Black and White Sixlets for a fantastic retro look. Mix it with any of our other decorator colors for a custom look for a sports team or any party theme. Sixlets' small, unique round shape with cocoa and carob flavors make it like no other. Sixlets are great for cake and cupcake decorating, ice cream and frozen yogurt toppings, and other party favors. Try one and you'll be coming back for more! Sample a pound or 2 before committing to larger quantities. Need a machine to vend these chocolate coated candies? Be sure to see our full line of candy vending machines. Case Count: 5,400 pieces approx. Made by Oak Leaf, this bulk vending candy is gluten free, made in a nut free facility, and OU Kosher Certified. The candies typically vend for 25¢ in commercial vending machines that have an adjustable candy dispensing wheel which controls the number of pieces that vend per quarter. They will also dispense in our candy banks and dispensers. Candy is best stored in a cool, dry, low humidity location. Their shelf life can be up to 18 months if not exposed to extreme hot or cold temperatures.